Grey Days are In-Between Days. Sorry for the grainy picture. I would have taken the shot against my typical backdrop, but I haven’t had the gumption to take down the Christmas tree. I know it’s after Epiphany, but it’s the best tree we’ve had yet…. At any rate, the above is an example of more in-between dress. When going the monochromatic route, I like to mix texture and pattern. The Shetland wool roll neck is a plain weave, but the trouser is a glen check flannel (part of a three-piece suit). Suede shoes (Bally) and belt, hoping it won’t rain as predicted. Cold and wet. Not my favourite, which is why the fabrics are all warm and soft. If I venture out and it’s not raining, this will get topped by a DB camel-hair polo coat. 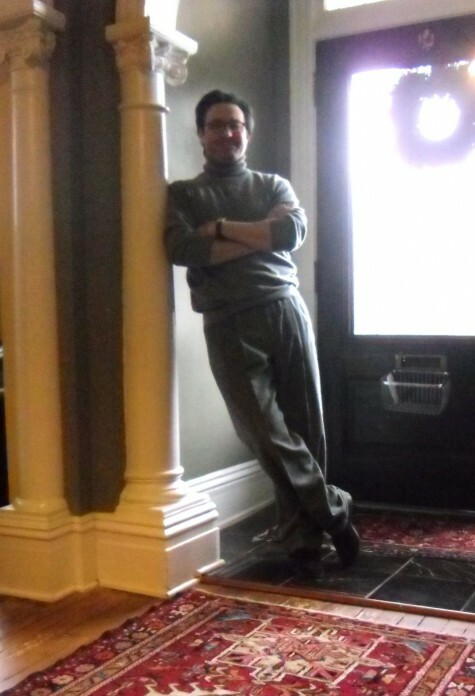 This entry was posted in Elegantology and tagged Bally, casual men's clothing, Flannel trousers, glen check, suede shoes. Bookmark the permalink. 4 Responses to Grey Days are In-Between Days. No worries, our Christmas tree is still up, as well. I have no excuses here, though, as it’s been near 80 degrees for three weeks now. I’m wearing linen today! J&G, I love camel and grey together. Very sophisticated in my opinion. Turling, I feel better. Thanks. Very good looking Chris! I wear every shade of grey imaginable this time of year. Heather, charcoal, etc. I have taken to wearing some color in my scarf, earrings, or if layering a snug chemise.